For the safety of your child, their friends, and the local community we request that you park safely, legally and considerately. 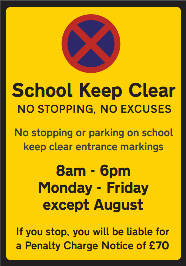 This means not parking on single or double yellow lines; not double parking; not stopping or dropping off on the School Keep Clear yellow zig zags or pedestrian crossing white zig zag lines; not parking on corners or junctions near the school entrance; not blocking driveways. 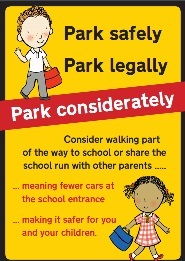 Try ‘Park and Stride’ – park away from the school entrance and walk the last 5 or 10 minutes. Walking half a mile only takes between 8 and 17 minutes. How many calories you burn depends on how fast you walk! Try a ‘Walking Bus’ – organise a small group of parents to share the walk to school and take it in turns with other parents to do the school run. You could even combine this idea with Park and Stride. Walking to school contributes to the recommended daily physical activity for you and your children. It also helps to reduce congestion around the school and helps to improve air quality, providing benefits for everyone. Try Car Sharing – if you have to drive to school then get together with other parents who need to go by car and take it in turns to drive. You could start by doing any of these just once or twice a week. Please click on the pictures above for further information.